Functions make your HTML5 game code safe because variables created inside a function are destroyed when the function dies. Sometimes, though, you want data to move from one function to another. One solution is the global variable, but it’s kind of a crude option. A better solution is to allow data to pass into and out of functions. Of course, this program could be written by creating a really long string variable and then copying it to the innerHTML attribute of the output div, but that would be quite inefficient. Instead, you can use functions to simplify the work. Begin by looking over the main function: makeSong(). The program writes to a div called output. You will make a variable called output that corresponds to a div called output on the page. Write text to output. That’s not surprising, but it is interesting because there are no text variables or values in the makeSong() function. All the text is created by other functions. There are two other functions in this program: verse() and chorus(). Both of these functions create string values. Verse can be “fed” a numeric value. The verse function is especially important because it can be passed a value. The verse changes behavior based on the value passed to it. 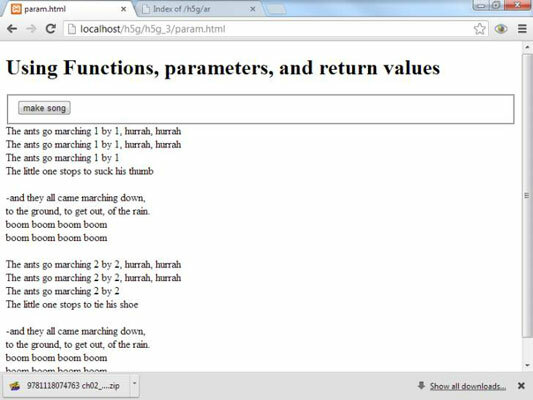 To truly understand what’s happening here, begin with the chorus() function (because it’s a little simpler than verse()). Create a variable called result. This variable holds the result of the function’s work (which will be a string value containing the chorus of the song). Append HTML code to the result variable. This code has several lines that build up the result. Note that this is HTML formatting because this code will be printed in an HTML div. The last statement of the function is special. The return statement allows you to specify a value that the function returns to whatever code called it. Use the function like a variable. The verse() function also returns a value, but it has another trick up its sleeve. Although the chorus is always the same, the verse changes a bit each time. The little one (who appears to have attention issues) gets distracted in a different way on every verse. The verse() function is very similar to the chorus() function, except it is more flexible because it can accept a parameter. Call the function with a value inside the parentheses. When a function is intended to accept a parameter, it must be called with a value inside the parentheses. In makeSong(), you see calls to verse(1) and verse(2), but never verse(). That’s because verse is designed to always accept a single integer value. Define the function with a variable name inside the parentheses. If you look at the function definition for verse(), you see it contains the variable verseNumber between the parentheses. Whenever the verse() function is called, it must be fed a value, and that value is placed in the special variable verseNumber. Use verseNum to find the distraction. Analyze the verseNumber variable and use it to find the appropriate distraction. Put this in a variable named distraction. Incorporate the verseNumber and distraction variables in the result variable. The main function uses the returned value as a string, printing out the verse.